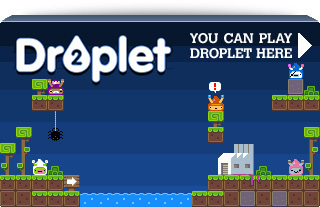 Quite frankly flixel is awesome. It allows me to rapidly build games. The sort of games I like playing (and therefore making!) While it does a lot for you it is lacking in a few key areas. After all it’s just a framework, and frameworks are meant to be built-upon. That is where the Flixel Power Tools come in! At the time of writing there are 13 new classes, all neatly arranged in a single package, that push flixel just that little bit further. There is also a test suite which include 16 easy-to-follow examples of the power tools in action, with a funky visual menu system and a way to actually see what they do. I always find it easier to learn by looking and then checking out the code! 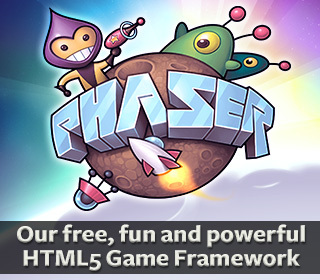 The majority of these tools work without even touching the core flixel code-base. Although there are some that do require it, so with that in mind I’ve provided a fully Patched version of flixel 2.43. But if you’ve got your own build there are instructions on manually patching at the top of each class that needs it, and work-arounds should you not want to touch anything at all! 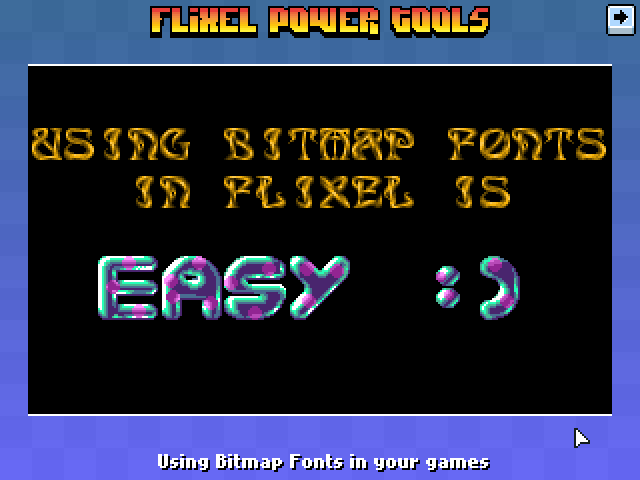 Allows you to use bitmap fonts in your games very easily. It’s extremely fast. Fast-enough for real-time updates, or a GUI or HUD display. The rendered text is just a normal FlxSprite, so you can do with it whatever you like. Extensive character-set handling options and fully documented. 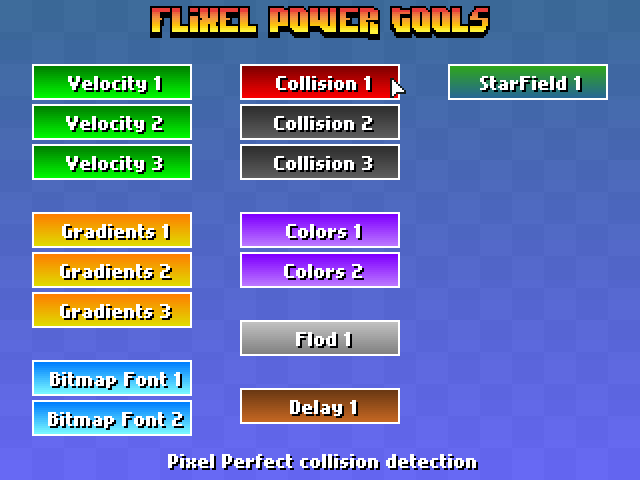 Collision in flixel is handled with bounding boxes. Which is basically two rectangles colliding, and if they intersect you get a collision back. This class takes it the necessary step further and adds pixel perfect collision testing. Only the intersecting area is tested for speed. And you have control over the alpha tolerance level (so you can exclude pixels with an alpha level less than what you need). It also works with scaled, rotated or animated FlxSprites! and is perfectly fast enough to use in real-time. // Player really did hit those spikes! A very comprehensive class for serious colour manipulation! As well as being able to rip-apart and put back together colour values across all kinds of ranges (ARGB, 24/32 bit, to/from Hex, etc) it also has support for colour interpolation; HSV colour wheel generation; random colours and advanced colour effects. Including: getting a complement harmony colour, analogous harmony, split complement harmony, triadic harmony and RGB to HSV and HSV to RGB conversion. A useful timer that can be used to trigger events after certain amounts of time are up. Uses getTimer so is low on resources and avoids using Flash timer events. Also takes into consideration the Pause state of your game. If your game pauses, when it starts again the timer notices and adjusts the expires time accordingly. A work-in-progress class. At the moment contains one function: screenCenter, which takes an FlxSprite and then centers it on the x or y axis (or both). Gradients are a staple of most retro games, usually used for pretty sky-backdrops or to fill in game objects or text panels. This class provides an extremely easy way to create those. 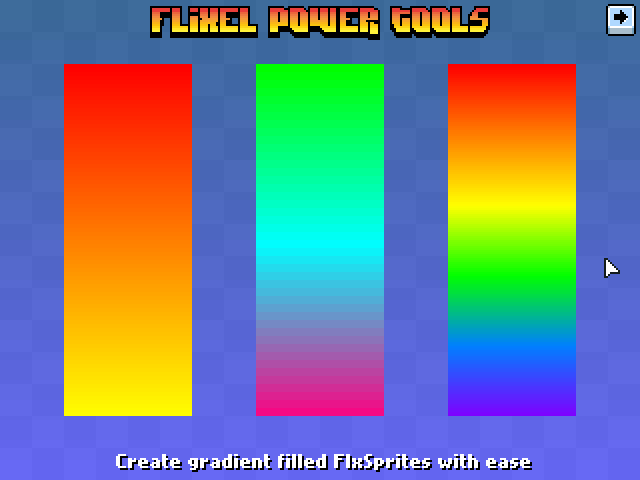 It can generate an FlxSprite filled with the gradient, or overlay a gradient onto an existing FlxSprite (or portion of it). It can also generate an Array full of gradient values for use outside the class. Just give it an array of colour values, and it will do the rest. Gradients can also be “chunked”, making them less smooth (and more retro!) and rotated to any angle. I use grids a lot in my games, usually for aligning on-screen elements or sprites. This handy class will generate an FlxSprite filled with a grid of your dimensions and colours. The grid can be in a checkerboard style, or vertical stripes, and it can also be overlaid on-top of an existing FlxSprite (if you set the alpha channel on the colours you can build-up some really nice effects with just one line of code!) The background of the Test Suite was created with this class. Like it or not, math is fundamental to game progaming! This class provides some new or just faster math routines, which a lot of the other classes in the package rely on. Things like radian/degree conversion, vector lengths, dot products, random numbers between ranges, random signs, value wrapping and a really fast sin/cos table generator. A class to help with setting and using the velocity of FlxSprites. With this you can move one sprite towards another, move a sprite towards the mouse, get distances between sprites / mouse and get angles between sprites and the mouse. It doesn’t sound very exciting (and it’s not to look at) but they can start to save you real time, and keep your code tidy and clean. Keep your eye on my blog and the svn commits for updates! 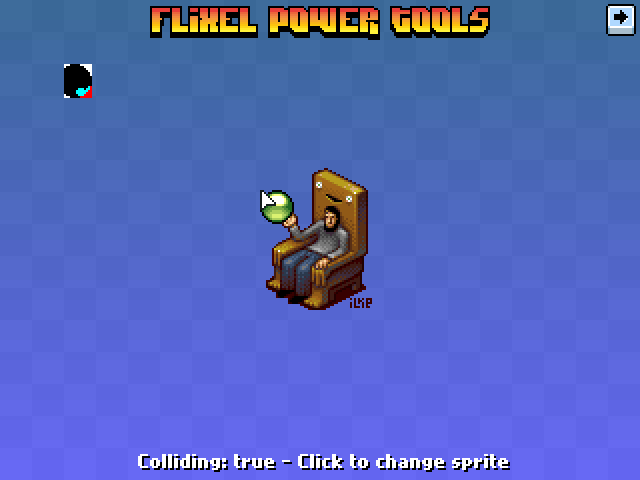 The Flixel Power Tools are part of the Flash Game Dev Tips Google Code Project. You can download a zip file containing the tools, a patched version of flixel and the full test suite. Or you can checkout the repository from Google Code svn, and get exactly the same things, but far more up-to-date! As I’ll be working on this constantly. When I hit a major new version I’ll re-build the zip, but svn will always be bleeding-edge. Any questions about any of the tools? Ask me in the comments, or more usefully on the flixel forums. Posted on April 2nd 2011 at 12:33 am by Rich. Awesome! These look like a bunch of handy classes to have around. Many thanks. Good job–these are some genuinely useful classes, particularly Color and BitmapFont (for me anyway). Prost! This is amazing! Thank you so much for these!! Hi. You must add “solid check” in FlxCollison. Because if you want to play “death animation”, your objects will still be checked for collision.